One of my favorite shooting locations was ASU. 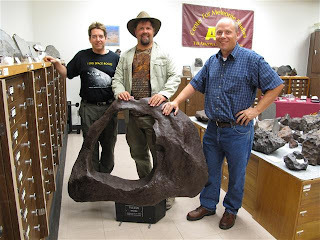 I was treated to a tour of the meteorite stores. And all I can say is WOW! I unfortunately left a couple of big piles of drool for the janitors to mop up and ruined a shot when the camera guy slipped. Seriously, I was absolutely amazed at the collection they have. 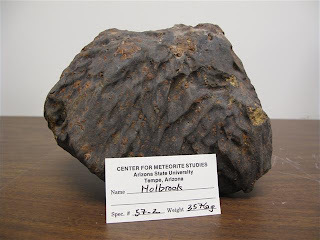 My favorite was the Holbrook featured below. Does that say 3,576 g? 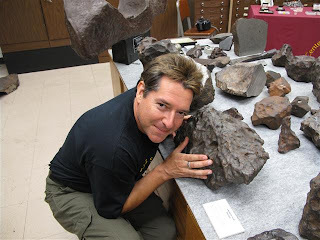 Geoff enjoying the ASU meteorite collection. 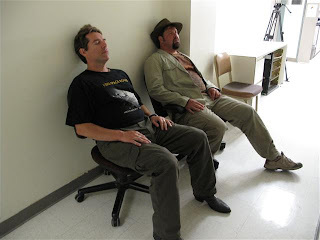 It was an arduous shooting schedule which left the guys to grab some down time whenever and where ever they could.